I have been hearing about the the website FameHog.com in passing for about a year now. While looking up some famous special effects makeup artist I ran across the website. At first I thought that FameHog was just some blighter’s attempt to take advantage of starving makeup artist looking for work. However, when I found out that one of the cofounders, Jason Hamer, is a special effects makeup artist himself, I decided to take a closer look. It doesn’t mean he is not a blighter (I don’t know the man), I am just saying that it makes me more hopeful that this website is providing a useful service. Plus, I find that special effect makeup artist are usually quite friendly people. I think it’s all the chemicals that we deal with. I always get the giggles after I use Crystal Clear on my finished sculpts. It seems like a reasonable price to pay to get a professional presence on the web. However, not everyone is accepted. They vet all application to make sure you are serious. I wonder if I would pass the vetting process? What about those looking for talent? I wanted to see what the talent search looked like on the site, but you have to sign up for that. Those hiring can look for 3 months for free, but then they have to pony up the cash as well. At least you know that those who contact your through FameHog are serious. So what makes FameHog different? So far it looks like a one stop shopping area for anyone hiring talent for film and TV. Plus, it has a clean, cohesive, professional and user friendly look. You don’t have to fish through a bunch of crap to find someone’s contact info. Maybe I am just another blighter? I will contact Jason Hamer to see if he can give us a few more reasons why they are different and learn more about their screening criteria. I will also see if I can get accepted. I am not sure how I stack up to their current members – Christien Tinsley, Eryn Krueger Mekash and Steve Wang. Next to them I probably look like just another blighter, with tub of silicone and bottle of Telesis. But then again, you never know…. miracles happen everyday! Please feel free to leave comments and let me know what you are thinking. 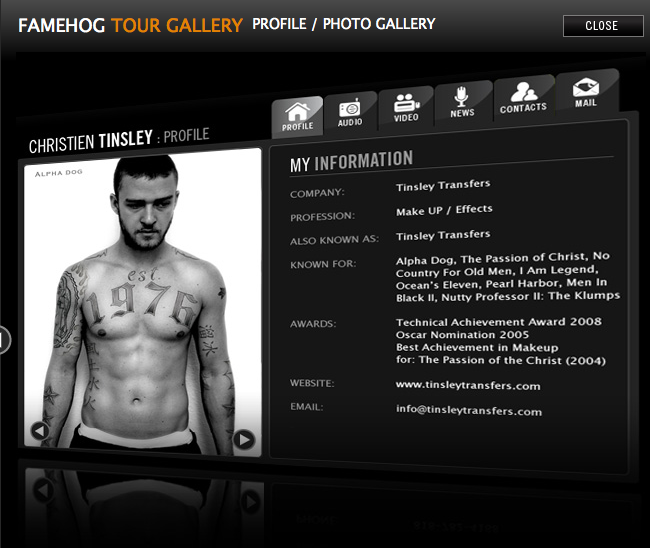 If you have a profile on the FameHog website, I would love to hear from you!